Just made these for my first time ever making Macarons. They were great. I followed everything you said and there was no problems. I even made at high altitude and no problems. Thanks for a great recipe. I was always so intimidated by them before. Yay, so glad you had macaron success, Cherie! Thank you for sharing your feedback. First time trying Macarons and it worked great! Even at high altitude. Just made these for St Patrick’s day and we loved them. Didn’t wait the 8 hours to try one but still great ! Thanks for the tips and tricks. Seeing “feet” made my day. Here I go, my first time making macarons! Is there ANY vanilla in this recipe? 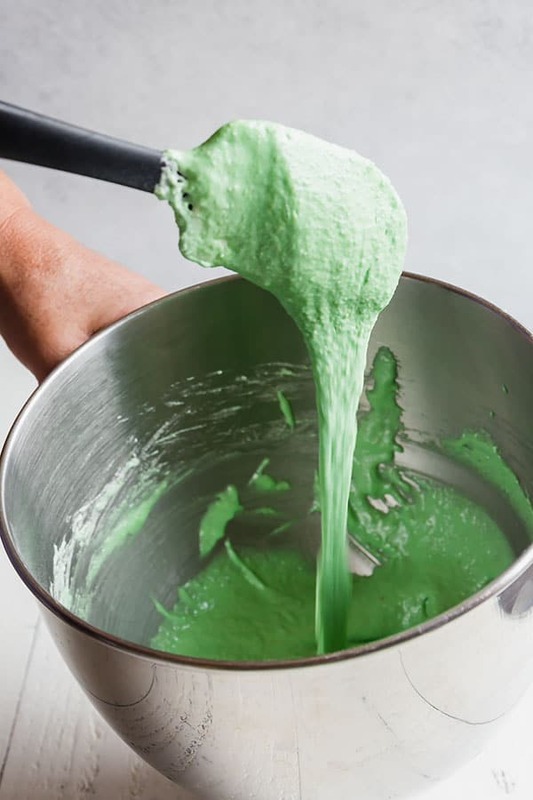 The ingredient list does not include any, but step 3 says to add vanilla and mint extracts, along with the green food coloring. Hi, Claire. Sorry for confusion. I used to add vanilla extract. But since it’s additional moisture, some people have issues with the batter, so I removed it. Just tried this and now my kitchen smells like Christmas! Oh. My. Lord these taste like heaven! I had to redo the filling though because I used white chips instead of white CHOCOLATE chips. Though that was my fault. This recipe is amazing! Question, I used parchment paper but the footing of the shells still stuck out! I read that the parchment paper was supposed to prevent that, so I’m just wondering what went wrong. This recipe is great though, I will use it again! Much love to you Shinee! Hi, Brenna. Your macarons may have been slightly under-baked. Also, I read a great tip in Lauduree macaron book: When you pull out the baking sheet, drop a small amount of water (not too much!) under the parchment paper and let cool completely. The steam will make it easy to remove the shells, once they’re cool. Maybe try this trick next time. ur tip wig mixing is false, it came out too thick and the baking didn’t turn out as the pictures here…i imagine reversed ur photos, are you sure those are yours?? Hi, Maxine. 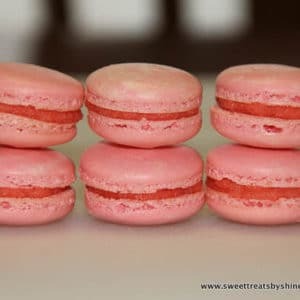 I’ve shared dozen of macaron recipes for different flavors on my site and make macarons with the same base recipe all the time. So yeah, I’m pretty sure these photos are mine. Instead of being suspicious of the source of my photos, you could have asked what YOU may have done wrong. Macaron is not an easy thing to make, and mixing technique comes with an experience, but with your attitude, I can’t be any help to you. So I hope you’ll find a recipe that you’ll be happy with. Good luck! hi Shinee i am back with another question. how many macarons does this recipe make?? and if it is a little amount is it possible if i could double the recipe or would that wreck the batter??? Cassie, I get about 20-25 filled macarons (about 40-50 shells). They’re about 1.5-inch rounds, so they’re small cookies. I’ve never tried doubling the batch, so I can’t say for sure if it’ll be the same or not. Awesome! So glad you found it helpful, Cassie! 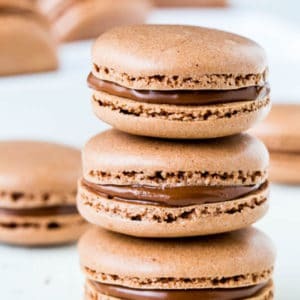 i am making these Macarons for a school project and i am REALLY NERVOUS because this is my first time making macarons and i need these to be amazing. Are there any tips you can give me??? Hi, Cassie!! So excited for you to try baking macarons. I’ve written a detailed Macaron 101 guide and this helpful tools for making macarons. Hope you’ll find them useful. I have never made macarons, but will be trying them tomorrow as a 50th birthday gift for a friend. However, I would like to make two different flavours to be gift-boxed. How do I halve one batch and flavour each half differently? At what stage do I add the flavouring and colourant? 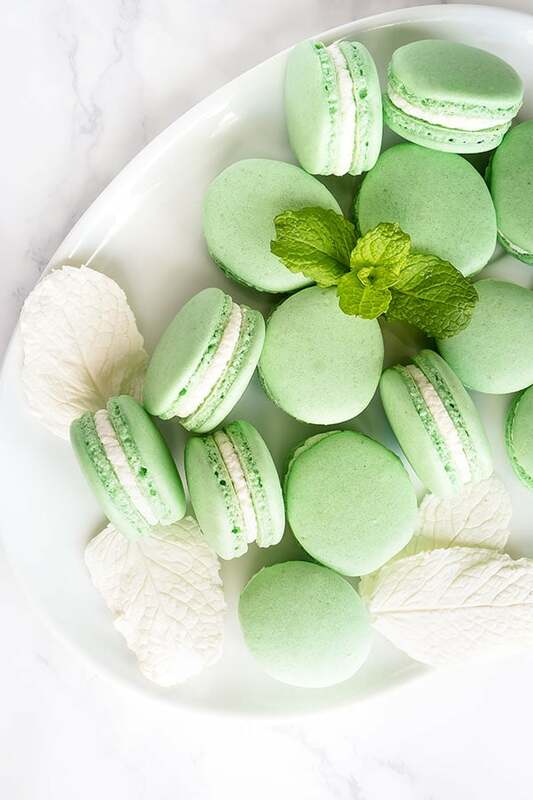 I would like to make the mint macarons as you’ve shown on this post, as well as salted caramel macarons ( I will leave these white/cream and sprinkle rock salt on top of the unbaked macarons). Hello! Once you measure out the almond flour and powdered sugar, do you compensate for any flour/sugar that did not fully sifted well? I have been following your recipes for a few weeks and I love them! I just always seem to have flour/sugar that won’t sift so I’ve been adding more, and the mixture is always thick, but bakes well. My question is, once you measure and sift, do you have any remaining flour/sugar bits that you can’t sift and just throw them away? Or add more to make a full 1cup and 3/4 cup? Thanks! Hi, Victoria! I don’t compensate for the leftover chunky dry ingredients after sifting. 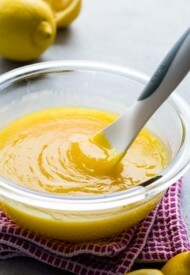 Up to 2 tablespoons is fine, but if you get more than that you would want to add a bit more of dry ingredients. I used to have a lot of chunky pieces left in the sieve, but since I switched almond flour brand I no longer have that issue, everything goes through the sieve. Hope this helps. Yay, I’m so happy you made these, Sandie! I bet your son was happy too. So yes, filled macarons freeze beautifully! I freeze mine all the time now. I put in two layers of ziplock bags to prevent freeze burn. For the ganache can I use heavy whipping cream instead of heavy cream? Hello! For the ganache, can I substitute semi-sweet or dark chocolate instead? If i did, are there any other changes that need to be made to the ganache instructions? Thanks! Hi, Megan. 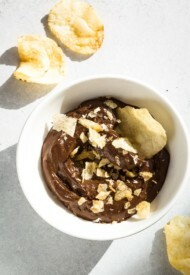 Yes, you can use dark chocolate. No change is necessary. Hope you’ll enjoy! Hi, Bryanna! Don’t give up yet, you’ll get there. 🙂 I know how frustrating it is when you get a failed macarons, but have you seen my French Macaron 101 guide? It has a troubleshooting guide with visuals for different issues. There’re so many little things could be affecting, so I’d suggest looking at that post very quick and see if you can spot the problem. If not, let me know and we can discuss further. Hi, so for Mother’s Day I tried making these but I’m so far at the folding step and it’s like a paste but I’ve folded it over 100+ times. Is it a gonner? What should I do? Should I try finishing it out and see how it goes, considering I’ve spent a good 2 hours already because the of the moisture in the air the egg whites would not turn into stiff peaks they would get to medium but not stiff stiff so I gave up and mixed in the almond flour and the powered sugar and it’s giving me a paste that looks grainy but when you pinch it it isn’t grainy at all almost like it’s all air bubbles. Oh no, so sorry to hear you’re having a trouble. If it’s not getting any more runny, then I guess you could try baking it now. Yeah, meringue doesn’t like humid weather, hope you give it another try on a dryer day. It’s been raining ever since and I did actually bake them, they turned out great besides how ugly and big they were cause the batter was so hard to pipe out. It’s a great workout though ???? hi I am so exited they seem just so delicious, and I am about to do your recipe but I have a question…. 100gr of almonds and 100gr of powder sugar ? or 1cup of almonds and 3/4cup of powder sugar ? Hi, Fenanda! Excited that you’re going to try these macarons. What is your question? 1cup of almond flour= 100gr almond flour, and 100gr of powdered sugar = 3/4 cup powdered sugar. I made these macarons and they came out hollow. 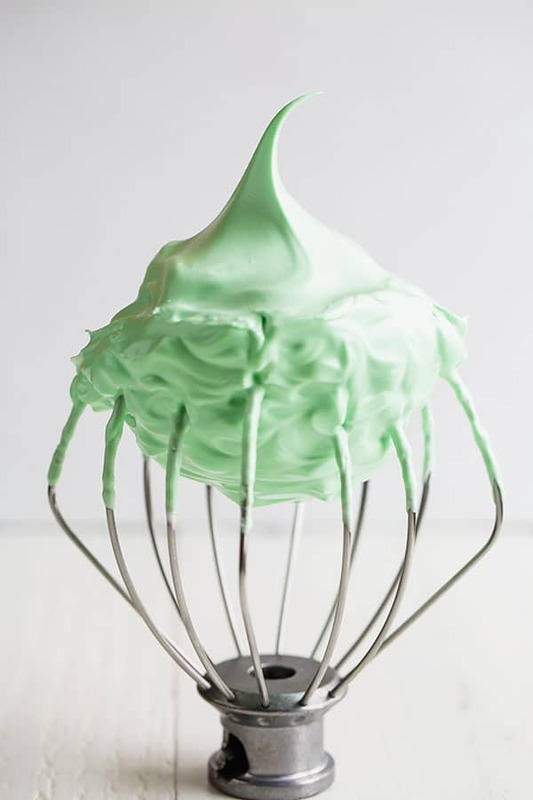 I know I didn’t over mix my batter and I was sure I didn’t beat my meringue wrong. Can you tell me what happened? Hi, Sarah! It might also be due to high oven temperature. Have you checked your oven temp with an oven thermometer? What could happen is that the macarons get raised in too hot oven too quickly setting the outter shell, then the inside isn’t cooked long enough and it collapses. That’d be my only other guess. 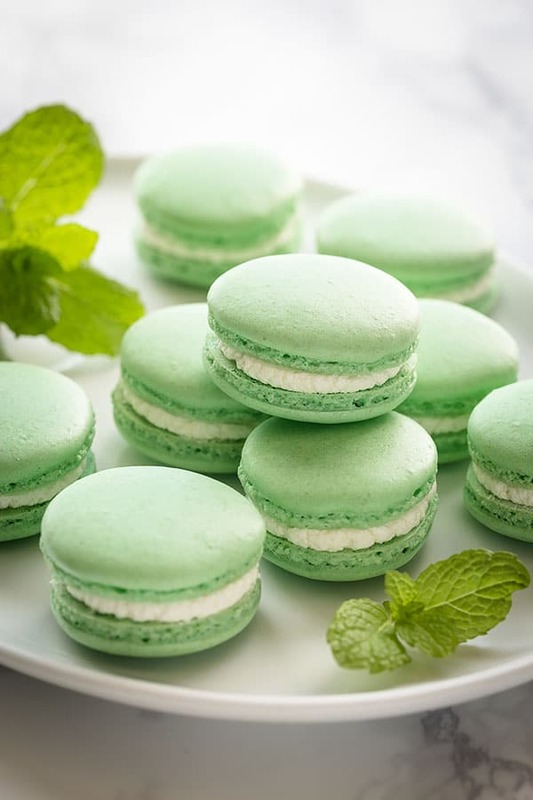 Can you add some very finely shaved pieces of chocolate into the macaron batter to make it a mint chocolate chip macaron? My friend is having a birthday and she loves that ice cream flavor. Hi, Michelle! I’ve never tried that so I can’t be sure. I don’t see why it wouldn’t work though. Let me know how it turns out if you try it. Out of curiosity, did it work? Hi there! Saw your recipe and will give it a try. But quick question – your recipe states 1 cup almond flour and 3/4 powdered sugar, but Mateo wrote in asking about the convergence of 3/4 almond flour and 1 cup powdered sugar. Which do i use to make this recipe? Thanks in advance for writing back. I cant wait to try out this new filling also! Hi Pammy! Please follow the measurements in the recipe box, which is 1 cup almond flour and 3/4 cup powdered sugar. 🙂 Hope you have fun making the macarons! Thank you Shinee. I had a typo earlier. I meant to say 1 cup of ‘almond flour’ instead of 1 cup of ‘almond sugar’. As you suggested to go by weight measurements. I will measure 100g of almond flour instead of I cup. Oh, I see, I thought you meant powdered sugar. 🙂 Yeah, it’s best to go by weight, it’s always more accurate. I weight all my ingredients for baking. Hope you have fun making the macarons. Let me know how they turn out. Diana, so sorry for confusion. Follow the weight measurements. I go by 1 cup of powdered sugar = 130gr. So 3/4 cup is about 100gr. I’m not sure why I put 2/3 cup here. Thanks for bringing it to my attention. I’ll update the recipe. Hello. Thank you for sharing. These look great! 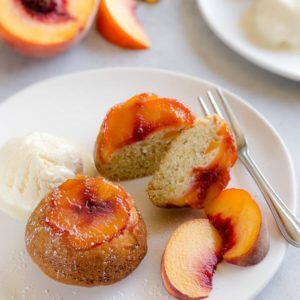 I really want to try them, but I do not have any almond flour at the moment. Would the result be different if I use regular flour? 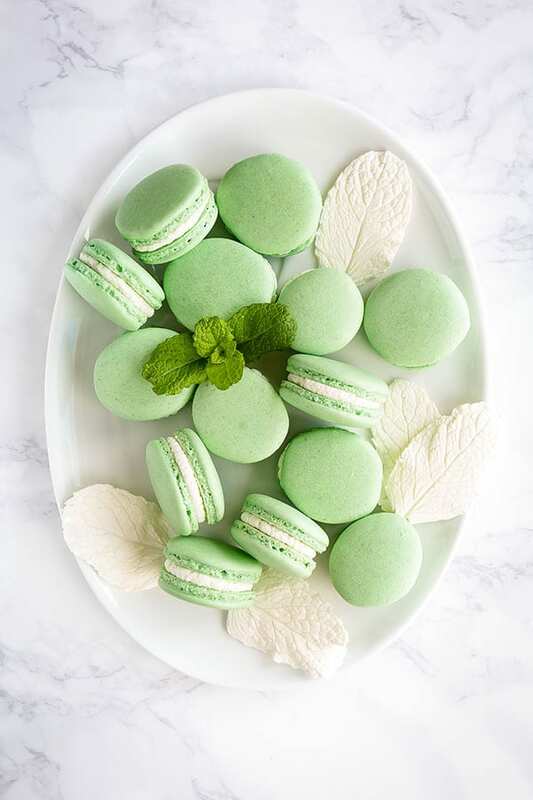 I want to try making your macaroons and was wondering what suggestions you have for storing them and for how long can they be stored? Hi, Sirvart! Store the macarons in the fridge in airtight container. They should be good for up to 5 days. Or you can freeze them for up to a month. Have fun! I’ve played around with this recipe about 4-5 times now and I have to say it’s amazing! I’ve finally gotten the right consistency for flat macarons with feet and I switch up the flavour profiles, using this recipe. It’s also the perfect amount for two trays. Kira, I’m so excited to hear you love this recipe. I too use the base recipe and change up the flavors. Thank you, Kira! I just died when I saw rhis post! 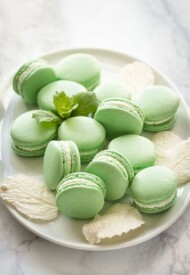 I am not good at baking but these macarons look amazing and so delish that I might just have to attempt to make them! Thanks for sharing the recipe! Hi Shinee! Thanks for the step by step and helping me with the holy grail of baking! I followed the recipe to a T, and the cookies turned a light brown. They aren’t over cooked and tasted delish… Have you seen this with a macaron that wasn’t over cooked? Thanks again, my first try went very well!! Hi, Michelle! First, congrats! And yes, it’s possible to get the macarons brown a bit on top. If you see them browning while baking, I suggest to place the second oven rack above the macarons and place an empty baking sheet. The browning is happening because the oven is heating too much from the top, so putting a sheet block the excess heat. Does that make sense? Hope this helps the browning issue in the future. Enjoy the macarons! Thanks for reaching out. I came to your website after finding your beautiful lemon macarons recipe. I always had an impression that making macarons is hard and time consuming process. But after watching your video and reading step-by-step instruction I decided to give it a try. Thank you very much for a great recipes! Thank you, Viktoria! 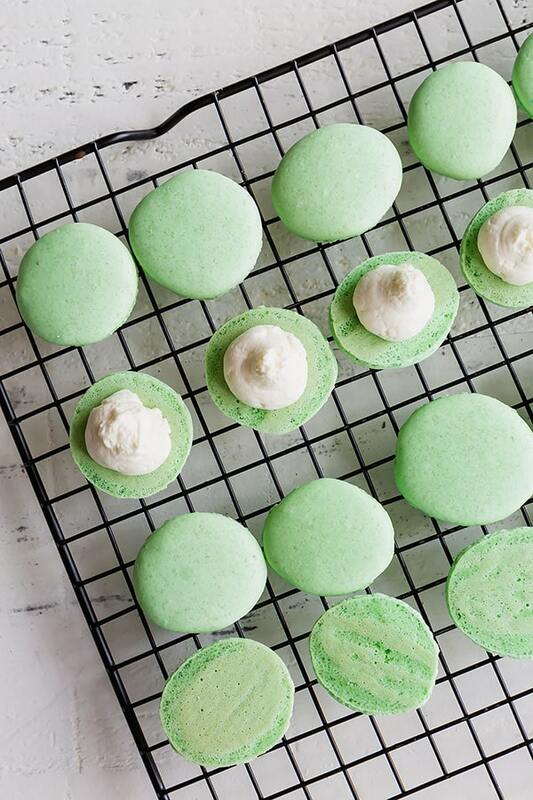 Macarons are not that time-consuming. I’m glad you were inspired by my recipe. Let me know how they turn out. 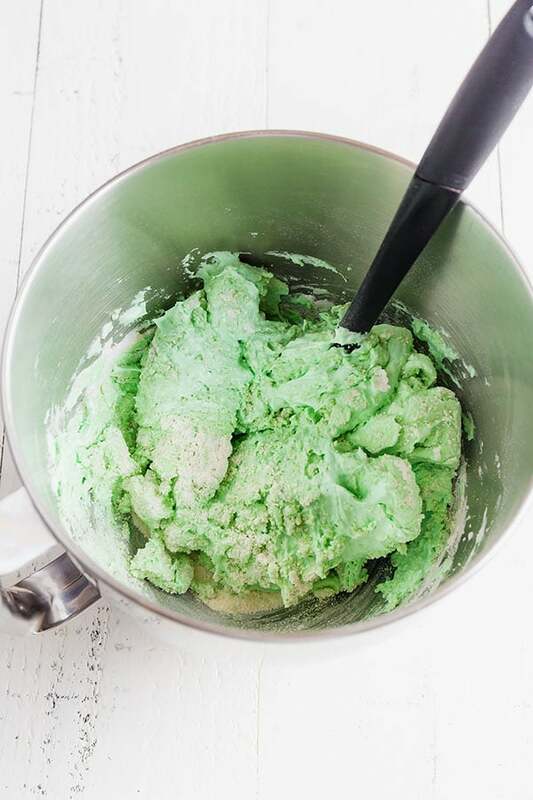 I used Pure Mint Extract from McCormick and it was awful! It tastes incredibly fake, like toothpaste. Do you have a preferred brand of mint extract? Hi, Ben! I also use McCormick one. It’s very strong, so little goes a long way. I used only 1/4 teaspoon and it wasn’t overpowering. I used 6-8 drops of mint essential oil in mine. Turned out amazing and gave it a real mint taste. I made this amazing macarons last week, and it was an extreme HIT! i loved the way they turned out. They were the best patch so far! I wish i can send a picture to see the results! thanks! 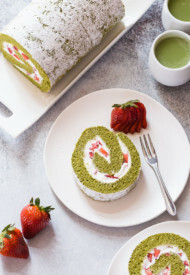 I was wondering if i could use the same recipe but with different extract rather than mint. Is that possible? I mean, can i switch the mint extract with other extract and use the same measurements for the remaining ingredients? Hiba, I’m so happy to hear that the macarons turned out great. You can send me the photo via e-mail, it’s [email protected] gmail.com. And yeah, you can use any other extract for different flavors. Just swap the extract flavor and nothing else. 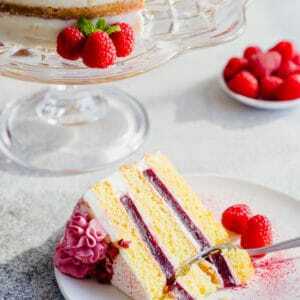 If you wish you can also use other fillings, like jam, ganache, etc. 🙂 I also have different macaron recipes on my site, like this lemon macarons. Hi. Thanks for sharing. Your recipe is amazing. When you bake your macaroons, which oven rack do you use? Upper or lower rack? My macaroons turned out to be yelowish top n bottom of macaroons, even though I followed the temperature n time in your recipe n the macaroons are still soft inside. Could you please tell what I did wrong? Thanks again. I bake mine on the middle rack. For browning issue, I would suggest to put the second rack above the one with macarons and place an empty sheet, or a foil to prevent further browning. Oven temperatures vary up to 50°F, it might be a good idea to check it with oven thermometer. Hope this helps. Do they get soggy if you leave em for a few days? … Or storage wise do the freeze well or what not? Hi, Lena. No, they don’t get soggy, as long as you keep them in the fridge. I’d recommend keeping them in the fridge for up 5 days. The flavors from the filling will infuse the shells, and it actually gets even tastier in couple days. You can freeze unfilled macarons shells for up to 2 months. Hey! Thanks for sharing… Gonna try my first macaroons ever this weekend! Does your recipe make 15 or 30 macaroons in total? Does it mean 30 halfs that then make 15 …… Cheers! Hi, Nora. This recipe will make total of 30 macarons (60 cookie shells). Hey, I was wondering if you have a pistachio recipe, too? Okay! Thank You for responding. 🙂 I’ll be looking forward to it! My sister loves the pistachio one too so I can share this with her. Okay! I just did. Thank You, again. Sure thing. Thank you, Sandy! how much is 3/4 cup of almond flour and 1 cup of powedered sugar in grams??? Hi, Mateo! 3/4 cup of almond flour is 80gr, and 1 cup of powdered sugar is 125gr. Thanks for asking, I updated the recipe with these info. Thank you so much! 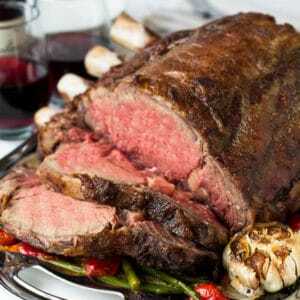 Another question, do you have this same recipe but bigger? If not, thank you anyway! Bigger, you mean for more macarons? I think you can double the recipe, but I’ve never done that before. Sorry. You’re welcome! I’m happy that your first macarons turned out great! Isn’t it such a great feeling of accomplishment? Raspberry macarons sound divine! I bet you will love my lemon macarons as well. Check it out here. Thanks for sharing! It is a good recipe. But I’m so confuse to the filling,that is white chocolate or white chocolate chips?? Sorry I confused you, Wan. I used white chocolate chips. Since I put my measurements in cups, I probably should have specified it. (Recipe is updated now.) You can also use white chocolate bar though, but just need to break it into small pieces. Thank you for stopping by and your comment. Wow- these look amazing! I’ve never made macarons because I think they look intimidating. But seeing these in mint flavor, something i love, I’m not thinking about making this recipe. Thanks for sharing! Ямар их хөдөлмөр вэ. Happy spring to you as well!